While it was a bit brash of me to do this, yesterday I wrote that Guardians (SJ) will have trouble becoming self-employed/starting a business/escaping the rat race. Why would I go and shoot myself in the foot, considering that almost half the population fits into this category? Am I mad? In order words, the world is cut out nicely for this type. Why would they feel the need to carve their own path when the path that is out there for them seems more attractive and realistic? Well, there are some Guardians who are tired of working for people they don’t respect. They may also grow weary of working for a company that seems to have little sense of security, or working with a bad team of people. Nothing will drive your average Guardian crazy quite like working with a room full of iNtuitives! At any rate, the Guardians may have their reasons for wanting to go solo. Are you an SJ? Check out your type below for your escape guide! Of all the Guardian (SJ) types, the ESTJ is probably the best suited to self-employment. They make wonderful leaders and great salespeople, though they can be a bit overbearing and brash at times. And good luck trying to convince an ESTJ that he is wrong. To this type, there are two ways to go: my way or the highway. This can come in handy if they are running a sales business with difficult clients. It comes less in handy if they are running a business as a grief counselor. It will help if you already have experience working with a company where you have a reputation as a good decision maker. You will want to start out by engendering the trust of your co-workers and higher-ups. You’ll also want to be patient. When the time comes, do take action. Strike while the iron is hot and take on many responsibilities to rise up in the company. Once your leadership abilities and persuasiveness become apparent, you’ll rise to the top, or at least to a higher position within the company. From there, you’ll make your escape by taking control of a major department. The bottom line is that an ESTJ will need an existing structure already in place to create their self-employed lifestyle. It isn’t in the nature of any Guardian to just start a company out of thin air. But an ESTJ can use their reliability, purposefulness and stability to engender trust in their higher ups to their benefit. 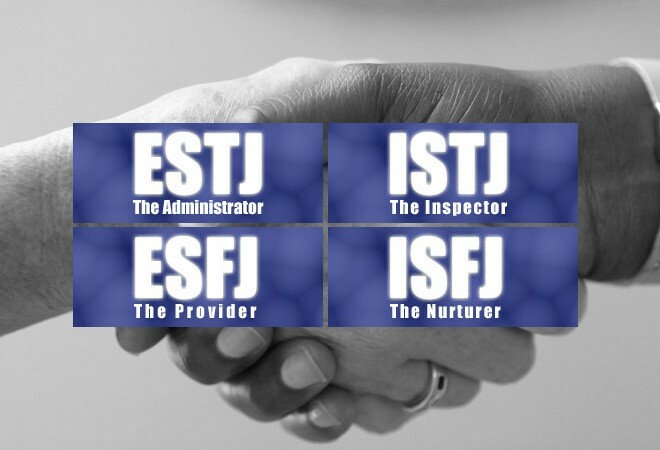 Like the ESTJ, the ESFJ will need to be working in a company with a supportive, caring team of people and a consistent client base already in place. Once they have enough clients through their company, they’ll need to make the decision to work with these same clients but on their own terms, or with more flexibility by going freelance. An ESFJ who goes this route will want to maintain an open relationship with their company at all times so they don’t get accused of “taking clients” away. An ESFJ will absolutely need to feel that their job is secure before going self-employed. If there is any error this type is likely to make, it’s that they will wait too long before taking the risk of working for themselves, even waiting until they have more than twice enough steady work to begin. Being security-oriented can be great, but some risk is necessary in the entrepreneurial world. ISTJ are excellent at fixing things, getting their ducks in a row, being useful and being stalwarts of society. They love to feel like they are being efficient, and are not big with grandiose displays of any kind. In other words, they would not make great salespeople. What they do make is an honest, straightforward, no-frills kind of person that you can depend on. If they have the drive to run their own business (and they would actually be quite good at it) they will run an honest business. An ISTJ will be hesitant to strike out on their own unless they see it as a lower-risk venture (for higher gain) than what they are currently doing. If they are happy with their careers, they’ll probably stay there. If they are dissatisfied and/or they can see that going solo would help them to advance to a higher place, they may choose this route. To be successful an ISTJ will want to build their business around a trade or skill. This type of worker is great at learning a skill gradually over a period of time. ISTJ’s can be good business people, though they may be reluctant to make the plunge unless they see a good reason to do so. It will help them immensely to work with an iNtuitive (N) type who can see the big picture of the business. Sensitive, caring and loyal, an ISFJ makes a great employee! It is difficult to write this section for this type, as many ISFJs have little interest in taking the time to “go it alone” and start a business. Their Introversion especially makes it more difficult than average for this type to attract clients, and their sensitive nature can make it hard for them to run a business (where people are not always nice.) Still, where there is a will, there is a way. Very slowly and with a lot of support and planning. But you can do it! As an ISFJ, you will need to formulate a good business plan (much like an ISTJ) and then immediately find a few trusted Extraverted iNtuitve (EN) types to be the main “go-to” people for finding good leads and seeing the big picture possibilities of the business. Oh yes, and the business almost definitely needs to be helping others in some way, or you will lose interest! ISFJs are security-oriented, caring and nurturing people. They will actual do well running a business if they can get over some of the very traits that are normally their assets! For one, they need to be a bit less “security-oriented” or they’ll never get their feet off the ground. And they need to learn to be a bit less sensitive to criticism, which is a normal part of running a business. Great article! I am an ESFJ looking to leave my corporate home. I just took the test recently and the characterization of my personality is interesting. I do find comfort in the corporate structure. However, despite hitting great numbers year after year and still without promotion, I find myself frustrated, unappreciated and no longer interested in empowering others to dictate my self worth. In an effort to control my destiny I am embarking upon a journey to become a very successful real estate investor. In your list of great areas of transition for an ESFJ, real estate is there. Are there specific roles within real estate that are better suited for my personality type? Thanks for answering. I just don’t want to spend another decade investing in an area where I cannot grow. Thanks for stopping by The Great Office Escape and my apologies for the late response. We are working on ramping this site up this year, so feel free to stop back soon. ESFJs sometimes have it tough when they feel like their contributions are unappreciated by others or that they are “thrown to the wolves” at work and nothing is explained. As for real-estate I would say that the ESFJ’s optimistic, friendly and professional presentation fit very well for impressing clients and showcasing a good home. Plus you’d be able to relate well to others’ buying decisions as you are great with people. ESFJs make some of the best hosts and hostesses as they are so good at making others feel at home. A great career match in my opinion! I think that you could do well starting as an agent part-time and see if it is for you. Many agents get a fresh start and learn quickly that they aren’t happy with the hours/structure, but others fall in love with it right away. Only one way to find out!